I so love this business model. I saw these unique jewelry items at a small shop earlier this year but was in a hurry, no pen or paper to write down the info, and promptly forgot about what I felt was such a cool idea. A friend just sent me an email about this great company, knowing I would really respond to it, and voila, it’s the same group. 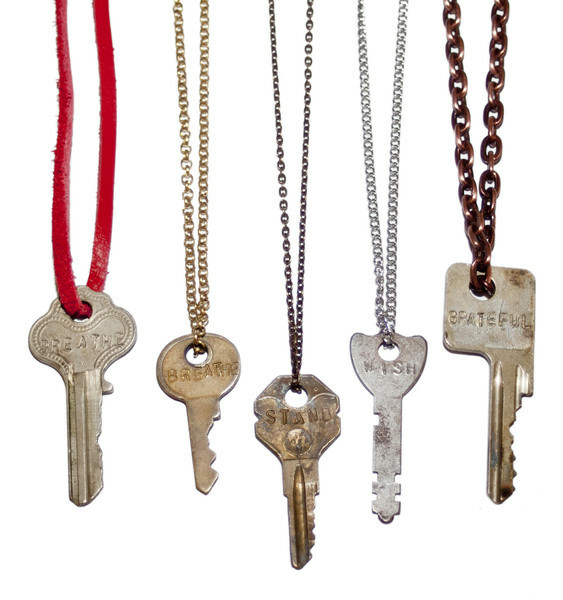 The Giving Keys is an organization, started by actress/singer/songwriter Caitlin Crosby, that creates necklaces and bracelets from recycled keys with hand-stamped inspirational words like GRACE, STRENGTH, HOPE, COURAGE, GRATEFUL, BREATHE, and more (you can also order one with your own word)…but the cool part isn’t just the funky style and conversation piece accessory…the cool part is that they hire only people transitioning out of homelessness to engrave each key. The makes-you-stop-because-it-is-so-simple-yet-profound idea is that you wear it as it inspires you, with the tacit understanding that when you meet someone, a stranger or not, who needs the message, you will give them the key, and then share your story on the website of how the key has traveled further on its journey. As you go to order yours (hello, amazing gift idea), spend some time reading stories people have posted–they’ll really touch your heart in such a great way. So effortless, so lofty, so generous, so human. Ideas like this make the world go ’round. I truly believe that.